THE SITE for Our Lady and St Cuthbert's Church was obtained from Sir James Fergusson of Kilkerran. 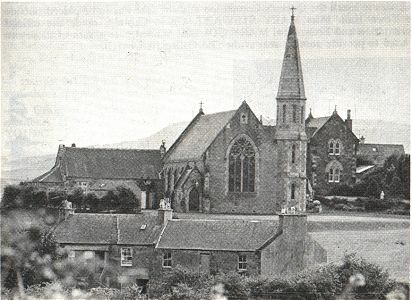 On the 4th July, 1876, the foundation stone was laid, the church being closely modelled on the Benedictine Monastery of Crossraguel. The first Mass celebrated in the Church was on Christmas Day, 1877, and on the 17th June, 1878, it was opened by the Bishop of Galloway. Since then there have been 12 Parish Priests. On the 17th June, 1978, to mark the church's centenary, a Mass was celebrated by the current Bishop of Galloway, The Right Rev Joseph McGee, the present Parish Priest, Rev Myles Moriarty, and former Parish Priests. The music at this ceremony was provided by a pipe organ, newly purchased and installed for the occasion. After the church service, a Dinner and Dance was held in Maybole Town Hall, attended by special guests and members of the congregation.